It is fascinating to witness how different people coming from a variety of different traditions — or no tradition or spiritual background — are drawn into this work with Igor, and how they find their way directly through their own firsthand experiences. Here we bring some sharing from different seekers who have found their way to Igor, and express their heartfelt first impressions of this work in their own unique ways. These are excerpts from the diary of Darakshan, a long-time follower of Sufism, who, in his world travels, found his way to one of Igor’s retreats in Mallorca. The days have a nice rhythm. An early morning stretch, an hour of sitting, breakfast, two hours of teaching. Then lunch and a long break, napping recommended. Then at 5 pm an hour of sitting, dinner, two more hours of teaching (including lots of Q&A from the morning) and then to bed. Anyway, all these verbal teachings are, in a sense, a sweet distraction offered to keep our minds happy. The real work happens at another level as we gather and sit and eat together, doing the work, having our various meltdowns and breakthroughs…. As the deepening retreat process with Igor Kufayev continued, so did my opening to his work and the community he has drawn together… In the course of our workshop, I learned that Kufayev has only been offering these immersion workshops for a few years, but in that time has attracted a dedicated “sangha” of students who wish to dedicate themselves to this path. It’s easy to write off their inspiration as a “cult” — of course that’s what it would look like from the outside — but any group wanting to go beyond the limitations and taboos of our reigning culture is going to appear that way, whether their work is moving towards a more healthy relationship with our lives or away from it. 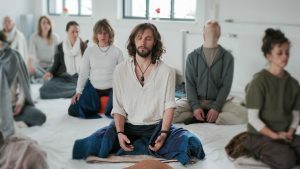 Interestingly, this sangha has developed a unique dimension of Kundalini meditation, involving rich spontaneous vocalization, sometimes chaotic and sometimes highly synchronized. A silent yet insisting inner calling sent me to book that immersion, so I knew that whatever experience would touch me, it would be the right thing to happen. Connecting with Igor and his speech was immediate as he embodies total clarity and shares his wisdom in a very sober, accessible way. I remember that the first set of meditation was very, very irritating to me. Although we had been well prepared for what was possibly about to happen, I could not believe my senses when the whole room got into motion as soon as we closed our eyes. In the beginning it was absolutely impossible for me to concentrate on my breath, as my perception stepped out to hear and feel everything that happened around me. 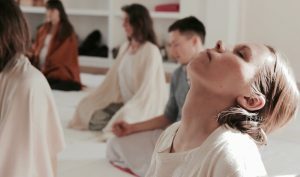 Instead of quietly meditating, I was busily occupied to distinguish voluntary from involuntary kriyas, and could not prevent myself from getting disturbed by every sound that did not appear “genuine” to me. As soon as I fully realized that the “inner judge” was trying to mislead me, my whole effort went into getting myself back to simply observe my breath. Igor then gave and explained us the mantra SO HAM, which made me shift inwards in a much more gentle and natural way. As the feeling grew stronger and stronger at some point I let go… and finally started to cry — silently, from very deep inside. I was shaken because it was through the kriyas experienced by the totality of the field, that I had accessed the soundless pain which resides in my own body. On the third and last day I understood why it is so important not to rush through things when being introduced into Igor’s Work. In the morning he calmly provided essential help for all those who found themselves in difficulties concentrating on the breath or discerning voluntary from involuntary kriyas. The little instruments he gave us made me fully trust and fall into meditation, this time without any effort. Vibrations and vocal kriyas made their way through my body, I did not hold them any longer out of fear that they could be “not real”. The kriyas that reached me from outside were no longer a menace, but a song, with no other quality than “as it is, here and now”. On the energetic level, I have been experiencing, for about a year, what I now understand to be kriyas. This started out intermittently and I didn’t really understand what was happening in the early stages. Over time the kriyas occurred more frequently, and and after a several-month stay in India they became almost constant. Then about three months ago, the kriyas became much more intense and were accompanied by dramatic emotional releases — some of which I had no context for in the beginning. I had a sense that things were going to get messy. I went to my teacher at the time and expressed my concern. He assured me that everything was fine, it would all pass, and I didn’t need to worry about it, but this was not the case. Sure enough, it did get messy. A sangha member who knew of Igor’s work suggested that I watch some of his YouTube videos. I did, and many questions were immediately answered. From this point, it seemed that the path was illumined. l knew that he would be able to guide me through what was happening. I looked into his schedule and found that he was soon to be teaching in my area. At the immersion, there was an immediate shift in how I experienced the energy moving through my being. Previously it seemed as though there was a tremendous force, something immense, trying to move through a tight space (hence the shaking, twitching and heat and friction). But then, in Igor’s presence, I became aware of what I can only describe as a “vessel” in the subtle anatomy that now contained the energy moving through. The longer I was in his presence, the more my awareness of the vessel deepened, the more the vessel expanded and the more room there was for the energy to move. This was my experience for the first couple of days in the immersion. On about the third or fourth day, while in meditation, Igor brushed his shawl against my shoulders and head. There came a sort of “rupture of plane”. Kundalini entered my consciousness all Her psychedelic glory! At first She circled my body, writhing, in a kind of dance, multi-colored, iridescent light beaming through the scales of Her skin, Her eyes terrifying, even as She smiled! So Other! There was a knowing in that moment that She creates the world, projects the world, through the light that radiates through each of Her countless millions of scales, each one, as it were, a facet of existence. But then, She entered me, became me, I became Her. I saw that I was Kundalini Herself — I became That, I was That — I am That. This energy has remained, and is constantly in my awareness — no, it IS my awareness. There is a kind of power that, in the beginning was having its way with me, making its way through me, that now IS me. It seems all very shamanic in nature — very primal. My sense is that it is Igor’s Grace that has allowed this transformation to take place. Several more times during the immersion, he came around with his shawl and brushed it against me, and there would be some expansion of that vessel. This inner expansion has continued during the retreat, and yesterday morning was the pinnacle — it has all come to such fullness… Words cannot express my gratitude. 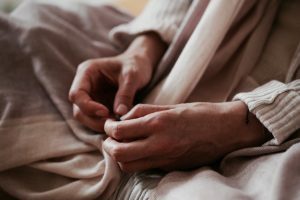 The first evening at the darshan I began to jiggle a bit, then we had an intro meditation and upon laying down my whole body started trembling, shaking. The next day I began experiencing kriyas, asanas — a very intense back bend developed. I trusted the process and let it take me, that went on during the meditation for a couple of days – my muscles were sore, I roared, I licked the floor, my arms were making specific movements, I was amazed my head was still attached! I was doing a back bend that seems impossible outside of divine meditation. It felt perfect though, that was the work to do, the work that was being done to me and through me. Then another asana emerged, Pindasana/Karnapidasana, bending my spine in the other direction than the back bend; the first time it emerged I could not fully get into it from the pain, but later that day a voice of intuition emerged from somewhere and I realized that I needed to go fully into the position, that it is like childbirth, or is some sort of birth, and I could use the breathing techniques that I learned when preparing for the birth of my daughter. So the next day when, indeed, it came back I did birthing breathing and once I was in that position I started wailing from some divine source, indeed it sounded very much like the wailing I did in childbirth. And then it was done. And then things shifted — the kriya force brought me to the seated meditation pose, it was very powerful, I was nearly thrown into sitting. 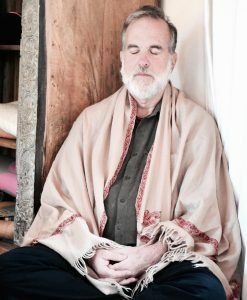 Other things seemed to be going on when Igor had us lay down – my hands would erupt in mudras; my fingers were doing the upward or downward facing triangles… There was a force of combining left and right — my arms would go to the sides or above my head, outward — and then come back to the hands together in “namaste” and my body would shake… It seemed like yoga was being done to me — the energy was just moving through me, doing its divine play.…it was as if I was completely in the flow of the energy that flows through Igor, as if I was synchronized with him or wired to that same energy that he described he was a conduit of. I must say all of this is pretty much new to me. In a not so distant past I was convinced that finding the guidance of a realized teacher was no more than a romantic idea, that would only occur to others but not to me. It is only quite recently that I discovered the huge number of spiritual teachers available nowadays… thanks to this YouTube era! Igor was the very last one I discovered, thanks to friends whom I met in a Qigong class. I listened to a few of Igor’s videos and a strong curiosity and desire to be part of this took over. Although still having many doubts, something stronger told me I just had to do this! So I did. But I also understood that my resistance was no more than an ego reaction, trying to protect its narrow boundaries. I knew there was nothing to be afraid of. If I felt afraid of something, it would have been the inability to open myself for the created energy and leaving the weekend with a feeling of failure and disappointment. I could not let that happen! So I tried to loosen my resistance in the second session and that felt like a big relief. My upper body started to spin, to rotate constantly and I understood some force was taking over here. 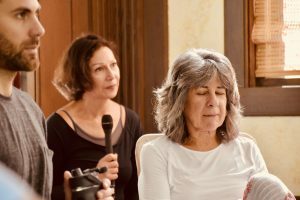 It was a gentle touch of grace, my thoughts were still very active but I knew there would be more to come… I was deeply grateful for that first “meeting” with Shakti. The last meditation on Sunday started gently with the same spinning movement of the spine and became gradually stronger and stronger. I felt my whole body vibrating and a hefty sensation was slowly rising towards my chest and throat. It literally took my breath and finally released itself in long vocalizations… I felt completely immersed and surrendered in that energy. Lying down on the ground my body was shaking heavily, accompanied with strong and long contractions in my abdominal muscles and fast respiratory movements. When the session ended I felt really cold, shivering and a bit nauseous. Despite that uneasy bodily sensation it was a beautiful experience! After the weekend I was dwelling in a peculiar state of stillness and satisfaction but also with many questions on my mind and a bit of confusion about what happened in that room… I was really curious how my next meditations would look like. After a while, the movement ceases and it feels as if my body is floating in space… my thinking mind remains noisy, but it’s more in the background and I can settle more easily in emptiness… Then the spinning begins again, and it goes on and on. Towards the end of the meditation, I experience different sorts of kriyas. Mainly strong spontaneous pranayamas like I used to practice them in my Kriya Yoga sadhana — extended inhalations and exhalations, with a long withdrawal of the breath in between. And also long vocalizations. I instinctively know there is much more to come out yet. In general, I can say that my meditation has truly transformed and that I am sincerely grateful for that. I hope I can go deeper and deeper… I have no doubt that Igor has launched an inner process in me and I can only hope it will continue unfolding itself! Our heartfelt gratitude to those newcomers to this work, who so generously opened their hearts — and enthusiastically put to pen to paper — to convey through words, their unique and deeply transformative first experiences with Igor and this work. So beautiful to read how this work touches everyone on such a deep level ! Thank you!